The life journey of Kevin Feakins and the Camlea Charollais Flock. Kevin feakins started farming on his own account in 1970, after spending a few years in commercial industry, then working for a well known polled Hereford breeder and sheep farmer in Herefordshire England. He is the son of a successful sheep, cattle and cereal farmer and grandson of a successful sheep farmer and trader, originating County Kent, England. Like his forebears, Kevin started farming with a relatively small capital and quickly built a business farming several thousand sheep also becoming a commission buyer sourcing breeding sheep, for what became a considerable farmer based cliental. He moved his family from Wiltshire to Herefordshire in the 1980’s and developed another business exporting live sheep and sheep carcasses to the rest of Europe. By the mid eighties, Kevin and his family were processing and selling between 12 and 15,000 sheep per week, sent mostly live, to clients throughout Europe. Those clients stretching through Germany, France, Italy and Spain, demanded the very best quality the UK had to offer. Kevin and his family soon built a reputation suppling those clients with the quality they required. Along with the activities of sourcing sheep and cattle for farmers, abattoirs and cooperatives, the production of quality lambs, on the home farm, became a priority. At this time in the UK, Charollais sheep were fast making their name as the ideal terminal sire on a lot of UK farms. The lambs sired by Charollais rams were becoming more sought after, achieving higher prices both in the live auction and the abattoirs. The majority of clients throughout Europe, actually demanded Charollais cross lambs. 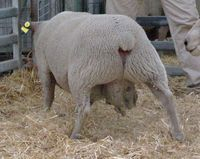 The UK farmers were quick to learn to use Charollais rams on there ewes, and lamb fatteners continuously asked Kevin to source Charollais cross lambs for their fattening operations. Over the years, Kevin has developed considerable expertise in the fat lamb industry, especially with regard to the Charollais sheep breed, having used them himself for prime lamb production for nearly 40 years. Kevin and Gina made the decision to emigrate to Australia in the year 2000 and finally achieve this goal in 2007. There epic move was triggered by the continuous build up of beaurocratic stupidity and pure nonsense, being dictated by the EU parliament. They moved to Camlea Station, in Northern New South Wales, where they established a prime lamb operation, using Charollais rams over first cross ewes. A flock of 3 to 400 pure Charollais ewes has been established to produce pure Charollais rams, both for their own use and for sale to Australian sheep farmers. Their intention is to progress the prime lamb industry to a better quality carcass, whilst achieving an easier lambing, with less stress on both the ewe and the farmer. They also produced cattle for the supermarket trade, and when they moved from the UK, they relocated there entire herds of Gypsy Cobs watermarkgypsycobs.com and Fell Ponies llancloudyfellponies.com from the UK, flying several plane loads of ponies to Australia. The largest movement of a single stud since 1960’s and to this date, Gina Feakins is still actively importing horses from all over Europe and the USA. As far as there sheep operation is concerned, they very quickly had abattoirs that would readily ask for and take all the Charollais cross lambs they can produce. One large abattoir has exclaimed that Kevin and Gina’s lambs are the best carcasses that turn up in their abattoir. Kevin’s experience in the UK, watching a prime lamb industry move away from producing over fat lambs, using traditional English breeds, to producing leaner, more saleable lamb carcasses from the newly arrived French breeds of rams, has allowed Kevin to amass considerable knowledge and expertise in using alternative rams to the old British breeds. He has always been ready and willing to pass on knowledge and help, in both lamb production and lamb fattening, to anyone who asks. Kevin remains confident that the Australian lamb industry will follow the British industry in moving to leaner saleable carcasses and the industry will slowly move towards breeds such as the Charollais to achieve this, along with easier lambing and higher meat yields.